In addition, 42 Osler lawyers were recognized as leaders within their respective areas. View the full list of our ranked lawyers [PDF]. IFLR1000 is the guide to the world's leading financial and corporate law firms and lawyers. Firm and lawyer rankings are based on transactional evidence and peer and client feedback. 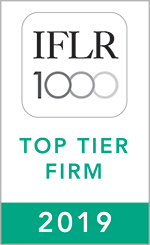 Find out more information on the IFLR1000 ’s 2019 rankings.